support throughout the season, and your patience as you waited for favorite varieties that never made their debut because of the hot, hot weather. We will definitely plant them again next season and hope for better results! We look forward to seeing you for pumpkins, squash, and fall decorations ...the stand reopening the weekend of September 29/30. Stand hours are from 10 am to 6 pm, with self serve after 6pm, while supply lasts. We have moved across the dooryard and renovated a space inside our large, red barn. We are stocking our new space with fresh locally grown vegetables, Cabot cheeses, and our very own fresh, homegrown ground beef. 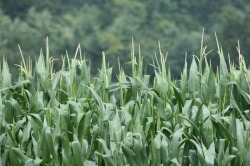 And of course, we haven't stopped growing and harvesting great tasting sweet corn, picked fresh, daily. Please Call! Our message machine always has a corn update if we don't make it to the phone. as long as the corn lasts.